This year’s British Open Spring Festival contest comprising the Grand Shield, the Senior Cup and the Senior Trophy was held in Blackpool’s Winter Gardens on Saturday 14th May. 1. Prelude and Toccata: Here the band had a ‘warm, bold start’,was ‘lively and articulate with a great ensemble sound’ (David Holling, ALL4BRASS.COM). 2. Elegy: In Memoriam, John and Marguerite Gray. 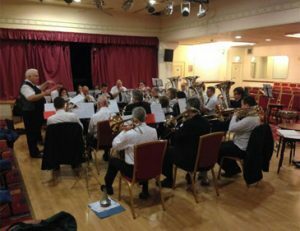 The band had some ‘fine moments with generally solid solo lines’ and despite a few nerves at times, there was ‘lovely control in the quieter playing’ (David Holling, ALL4BRASS.COM). 3. Rondo Finale: ‘The Rondo started well and displayed the band’s fine sound in the louder playing. Although not without the odd clip, the band played with style’ (David Holling, ALL4BRASS.COM). Placed 13th out of 18 bands, The Skelmanthorpe Band will once again compete in the Senior Cup next year. Thanks from the band go to Steve Barrans on percussion, Andy Horton on 3rd cornet and Bob Woffinden on tenor horn for their help during rehearsals and on the day.